3daniel (3 years ago) Inappropriate? iawval (5 years ago) Inappropriate? Tramp_Graphics (6 years ago) Inappropriate? Not a bad set of poses. 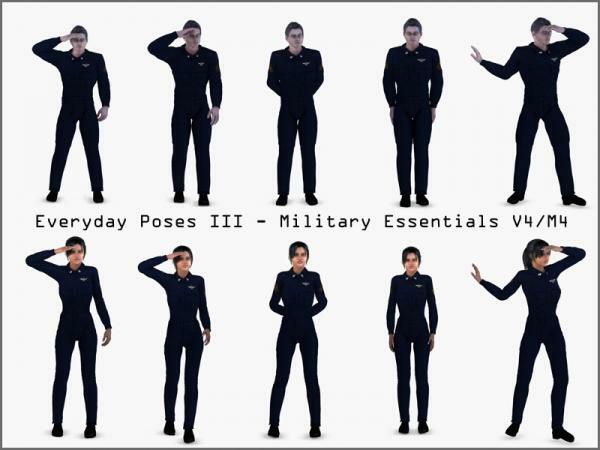 There is one glaring error you made in some of them though, namely the saluting poses. When saluting, you are supposed to be standing at "attention". This includes having legs together, knees straight, (but not locked, that can cause you to pass out), feet at a 45Â° angle, heels together. You have the legs separated, shoulder width apart. Thanks for sharing. Super job. Excellent! Very greatful that somebody has poses for regular people instead of supermodels in their CK's. Yes ! Excellent addons for the greats 2260 Scifi packages ! For my, the bests "Scifi "of the rendero store ! Eric Raven (9 years ago) Inappropriate?